Greetings! Topics in this Newsletter: stocking up the medicine cabinet (a few favorite herb recommendations), medicine bottle recycling, and an upcoming class offering. Have you ever wondered what’s in your doctor’s medicine cabinet? While preparing for the home remedies class that I’ll be teaching (see below), it occurred to me that it would be great to make a few recommendations on good herbs for home use. Here’s a brief overview of some of my favorites. As always, if you are pregnant, have a medical condition, or are taking any medications, please consult a doctor before using any herb. Medicinal Uses: Calendula is antiseptic, anti-inflammatory, and vulnerary (stimulates healing of tissues). Use topically to stimulate wound healing and to prevent infection. Best used as a “succus”, which is a type of tincture. Medicinal Uses: Chamomile is both soothing to the digestive tract and the nervous system. Use to calm tummy upset, relieve gas and bloating, to calm nervous tension, or to help with insomnia. Medicinal Uses: Dandelion is a bitter herb, “blood cleanser”, and diuretic. The bitter quality helps to stimulate proper digestion by enhancing stomach acid and pancreatic enzyme secretion. It’s “blood cleansing”, as it helps the liver to clear toxins from the body. This is helpful for many ailments (including allergies, skin issues such as acne, and hormonal issues) as well as to enhance health in general. Medicinal Uses: Echinacea is a wonderful herb for the immune system. It is best known for its usefulness in upper respiratory infections (colds), but can be used in any type of infection. Echinacea should be started at the first onset of symptoms, when it can exert its strongest anti-bacterial, anti-viral, and immune stimulating effects. Medicinal Uses: Elderberry is another immune herb. Elderberry syrup is very tasty and therefore a great herb for children (and adults of course)! It enhances immune function and has even been shown to be effective against the H1N1 flu virus. Medicinal Uses: Garlic has multiple medicinal effects in the body. It is well known as a cardiovascular protector: it can lower bad cholesterol, raise good cholesterol, lower blood pressure, and reduce blood clotting. It’s also anti-bacterial, anti-fungal, and anti-parasitic. Therefore, garlic is helpful for infections of varying types. It has a “warming” quality to it as well which is helpful for infections, as well as enhancing circulation and digestion. Medicinal Uses: Green tea is a fantastic coffee substitute. It has a small amount of caffeine, which can help with coffee withdrawal symptoms and cravings. In addition, it’s a potent antioxidant, which means that it can provide protection against cancer, as well as many other chronic conditions. Medicinal Uses: Lavender is calming to the nervous system. It’s great in teas or inhaled as an essential oil for stress, insomnia, nervous tension, or anxiousness. It is also anti-microbial as an essential oil, often combined with tea tree and other essential oils in topical anti-fungal formulas. Medicinal Uses: Nettles are a classic “blood cleanser”. They are particularly helpful for allergies. They come up early in the spring, just as allergy season is starting. The tops can be picked (with gloves!) and used in cooking. They are very flavorful and lose their stingers after a few seconds of blanching. They make a great pesto. Nettles are also very high in minerals so are a good “building” herb for people with poor nutrient status. Medicinal Uses: Peppermint is pain relieving, anti-spasmodic, and carminative (relieves gas and bloating). Peppermint is famous for calming digestive discomfort, thus the origin of the “after dinner mint”. It is also anti-spasmodic to the urinary tract, and for menstrual cramps. Tea is a great way to take peppermint. Medicinal Uses: Slippery Elm is anti-inflammatory and soothing to tissues. It is known as a “demulcent”; meaning it coats what it comes in contact with. In this sense it is wonderful for healing an irritated throat, digestive tract, or bladder. It is best taken as a tea, or mixed up as a “gruel” or slurry with warm water. It can also be applied topically to soothe irritated skin. Herbs can be used in cooking. Quite possibly….your garden! Often, culinary or ornamental herbs are also medicinal. Herb shops: in Bellingham we have two great herb shops, Living Earth Herbs and Wonderland Tea and Spice. 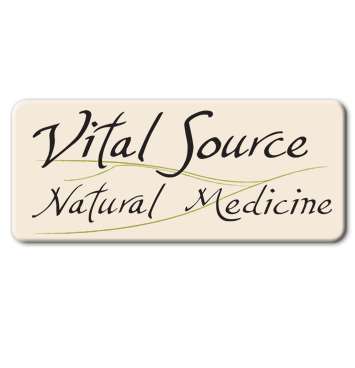 Sustainability at Vital Source is a high priority. Re-usable materials versus plastic or paper are used whenever possible, patients are encouraged to bicycle to their visits instead of driving, many of the office systems are paperless, etc. One area that seems a bit of an environmental burden at times is the quantity of bottles that leave here with patients each day. If you are a current patient and either haven’t heard or have forgotten….we take back all glass medicine and tincture bottles, sterilize them, and re-use them. There have been far fewer bottles coming back lately….perhaps you’re finding a great use for them! Otherwise, feel free to bring what you’ve got lying around back at your next visit. Thanks! I will be teaching a fun class on home remedies at the Downtown Community Food Co-op on Wednesday, September 28th, at 6:30 pm. Come and learn how to prepare and utilize fabulous naturopathic home remedies to treat a wide range of common ailments. We’ll go head to toe; examples of conditions include headaches, earaches, sore throats, digestive upset, skin conditions, bites and stings, and injuries. A variety of treatments will be covered: homeopathy, hydrotherapy, herbal medicine, and “nature cure”. This is a great opportunity to become more informed about ways to utilize what nature has provided us for healing versus reaching for something over the counter the next time you’re not feeling well. The cost of the class is $5 for Co-op members and $6 for non-members. Advanced sign-up is encouraged to secure a spot….you can do so in person at either Co-op service desk or by calling 360-734-8158.